“Someday,” Candelaria Garcia said to the author, “you will get all the stories.” It was a tall order, in Magdalena, New Mexico, a once booming frontier town where Navajo, Anglo, and Hispanic people have lived in shifting, sometimes separate, sometimes overlapping worlds for well over a hundred years. But these were the stories, and this was the world, that David Wallace Adams set out to map, in a work that would capture the intimate, complex history of growing up in a Southwest borderland. At the intersection of memory, myth, and history, his book asks what it was like to be a child in a land of ethnic and cultural boundaries. 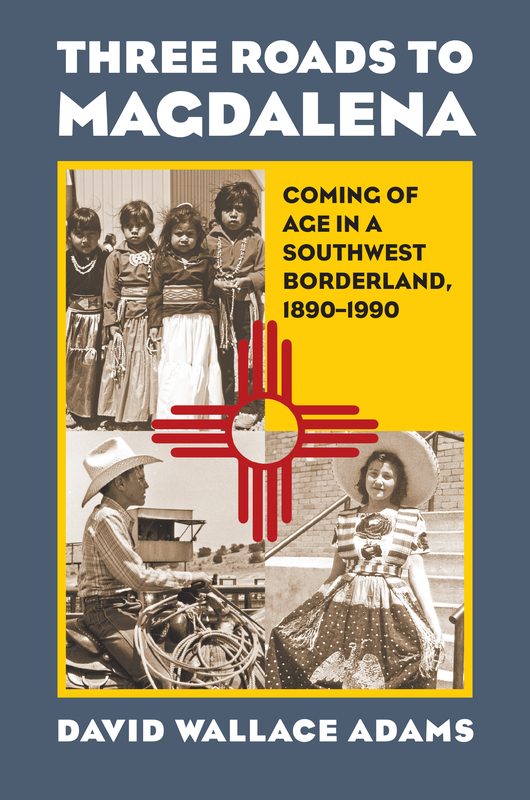 The answer, as close to “all the stories” as one might hope to get, captures the diverse, ever-changing experience of a Southwest community defined by cultural borders—and the nature and role of children in defending and crossing those borders. In this book, we listen to the voices of elders who knew Magdalena nearly a century ago, and the voices of a younger generation who negotiated the community’s shifting boundaries. Their stories take us to sheep and cattle ranches, Navajo ceremonies, Hispanic fiestas, mining camps, First Communion classes, ranch house dances, Indian boarding school drill fields, high school social activities, and children’s rodeos. Here we learn how class, religion, language, and race influenced the creation of distinct identities and ethnic boundaries, but also provided opportunities for cross-cultural interactions and intimacies. And we see the critical importance of education, in both reinforcing differences and opening a shared space for those differences to be experienced and bridged. In this, Adams’s work offers a close-up view of the transformation of one multicultural community, but also of the transformation of childhood itself over the course of the twentieth century. A unique blend of oral, social, and childhood history, Three Roads to Magdalena is a rare living document of conflict and accommodation across ethnic boundaries in our ever-evolving multicultural society. David Wallace Adams is professor emeritus at the Cleveland State University. He is the author of Education for Extinction: American Indians and the Boarding School Experience, 1875–-1928, also from Kansas.